On June 27, we welcomed our summer help and in a way also dog handler and kennel helper Conny, from Austria. With her arrival, lots of things went easier and mainly the old guys (our senior and retired huskies) finally started getting their, long time promissed excercise in form of walks to the lake and forrest. On the other hand, we started working on some extra projects, that took most of our time, such as building a wooden fence between the house and the dog yard, so that a bigger portion of our garden is available also the our puppies and old dogs. We also shoveled in 10 m3 of gravel, cut grass in the main dog yard, made a welcome sign, repainted some doghouses and so on. Switching to the "nightshifts" of working on the computer for our company, dealing with correspondence and working on our sponsorship program for the racing season. I can tell you, no time for munchin in the fridge, no time for sitting around after lunch or dinner. We were also blessed throughout June and July with relatively cool temperatures, so we managed to train the dogs 1-2 times a week. We had to leave for Czech Republic on July 22nd and returned last Thursday, August 2nd. I haven´t been on my daily hikes for all that time, including the first week after our arrival, until today. Today was my day! I finally arranged my time to go for my, much missed hike. And with that I decided to update this journal. Why did I write "victories" in the title, when all seems to be tight, no time for anything, hectic? Well, it isn´t really true. If I wasn´t in a better shape, I couldn´ve coope with so many things, with such busy schedule. I kept my eating habbits where they began and I am quite proud about that. I unfortunattley started to dring some coffee, but yesterday we bought cofein free Nescafe and since two days ago I had no coffee at all. I also drank some wine and beer in Czech Republic, so I will be more aware of what I drink now again. And I do dring quite a lot of water - about 3 liters a day now (a very good thing!). The major victory though, are refferences and comments from friends, family and people that haven´t seen me for a while. At least five persons (both in Czech Rep. as well as here, after my return) have told me that I have lost weight. That it is visible. I think I have an evidence for both, losing weight and being in better physical shape. Below are several pictures of me, starting in May, then beginning of July and last weekend. 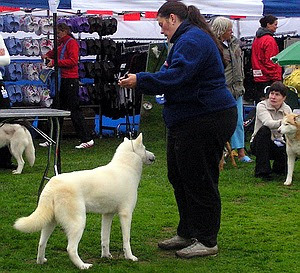 The other change is not what I see, but what I feel - last weekend I handeled 4 dogs at a show. It was quite hot day and I was able to handle all of them without feeling exhausted or running on the edge of my abilities, comparing to the show in May. And those of you who don´t know much about showing dogs, I can tell you it is a lot of running, especially here in Scandinavia, where the rings for worknig breeds are very large. Since tomorrow, prolongation of trail is in order!